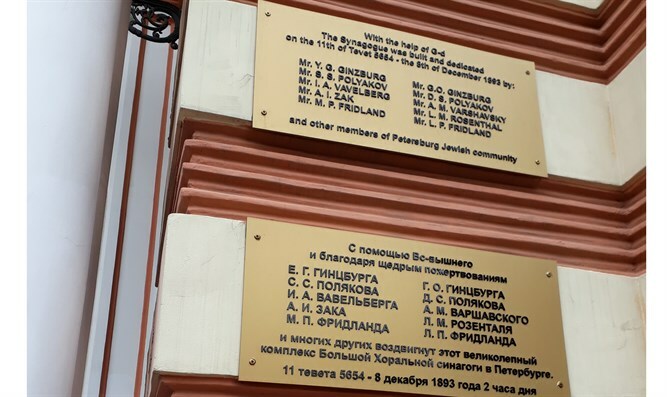 The week before Rosh Hashana, Arutz Sheva went out to learn about Jewish life in St. Petersburg, years after the mass aliya to Israel from Russia. The above somewhat limited analysis does not take into account latent or obvious anti-Semitism, white supremacists, Black Lives Matter, Antifa, political animosities and a desire to move to the Jewish state for ideological reasons, nor what may change in the future. It is not about those things. It is about how you feel getting up in the morning in the USA. 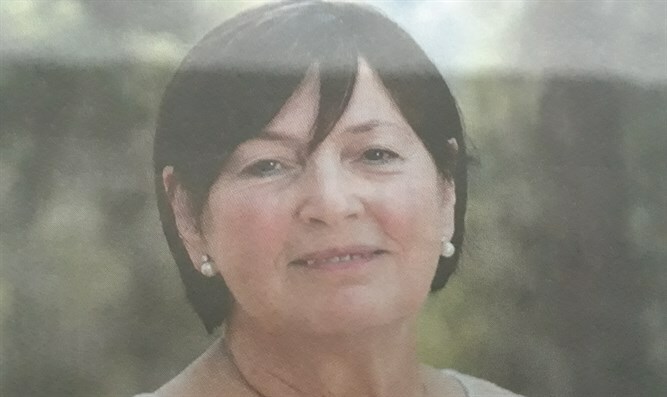 You go to work, shopping, shul, school, are part of a connected Jewish community of any type, only if you wish to be, daily life is just like everyone else's – and you take it as normal, take it for granted. Arutz Sheva went to St. Petersburg, Russia last week, just before the High Holidays, to examine how that works out in an Eastern European city with 100,000 Jews - this even after the massive Russian aliya to Israel - and a long Jewish history, and discovered that defining and understanding the existential state of Jewish Americans was good preparation for the trip. Because it is the same for Russian Jews in St. Petersburg. It's hard to imagine for those of us who associate Russia with the Tsars, the Pale of Settlement, Kishinev, Babi Yar, the Iron Curtain and the Leningrad (now St. Petersburg again) trial, but so it is. The Jews feel right at home, the difference being that some of them still think about it. And a number of them, not necessarily native Russians, work to make feeling at home compatible with feeling Jewish. Like in America, feeling at home has made it even more crucial to try to strengthen Jewish identity and Jewish pride. That is an issue we expect to face in Russia after 70 years of anti-religious Communism, but, sadly, America today is no different. Two people with whom Arutz Sheva spoke, Rabbi Menachem Mendel Pewzner and Roman (Yoram) Korovin (+79215740171) put the Jewish picture together for us. Why is it so relaxed for Jews in St. Petersburg today? "There is no anti-Semitism in today's St. Petersburg. 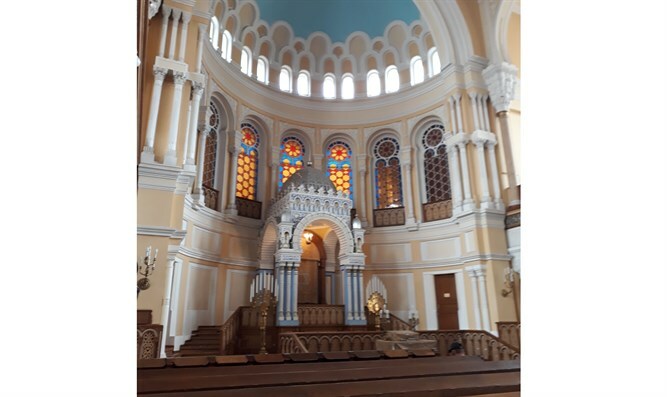 Vladimir Putin is pro-Jewish and people feel comfortable because of it," said Rabbi Pewzner, the dedicated Chief Rabbi of the city, whose office is located in the arrestingly beautiful Grand Choral Synagogue, built in 1881. The Rabbi, an American whose grandfather was arrested for teaching Judaism in Russia during the Communist era, has been the Chabad emissary to the city for 25 years, with the pace and variety of the activities he initiates or encourages showing no let-up. Still, reminders linger, and across the street from the shul stands a stark glass-fronted building which, we were told by Roman, was the KGB office whose windows were trained on the synagogue. Today a supermarket fills the entrance floor. Rabbi Pewzner:"We have made every effort to make the synagogue grounds welcoming for Jews and even non-Jews. We have evening performances where there are as many non-Jews as Jews. We want to bring the Jews closer to Judaism but show the non-Jews that they can benefit from the Jewish community as well." An elegant inexpensive kosher restaurant is on the premises, a kosher grocery store, snackbar, and even a simple, but spotless and spanking new hotel, all located behind the gate along with a Hassidic shul, Georgian shul, kindergarten, the Beis Chana girl's day school – and a place for young adults to meet, turning the site into a community center. "Look and see," the Rabbi advises. The next morning we arise early and see the sweet-faced Jewish kinderlach come to school, laughing and giggling at our interest in them, many of them on scooters but accompanied by a parent, some of them speaking to us in Hebrew. 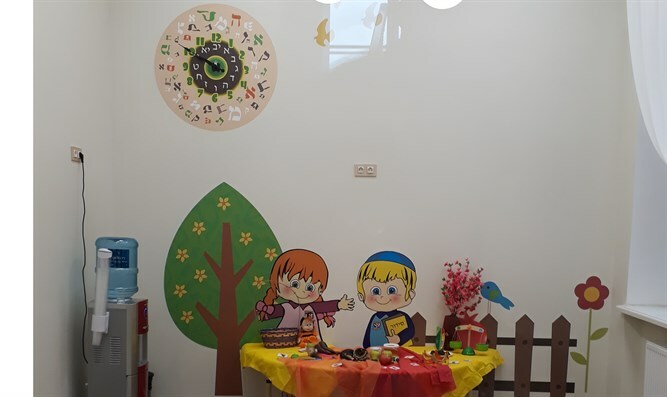 The city also boasts the Menachem mixed gender day school, a boys' cheder and the Shamir school affiliated with the Branover organization. Israeli teachers on the Heftziba program are welcome in all the schools. The Rabbi explains: "We want to accept anyone who turns to us, every Jewish child, and that causes problems with the number of hours dedicated to Judaic studies. 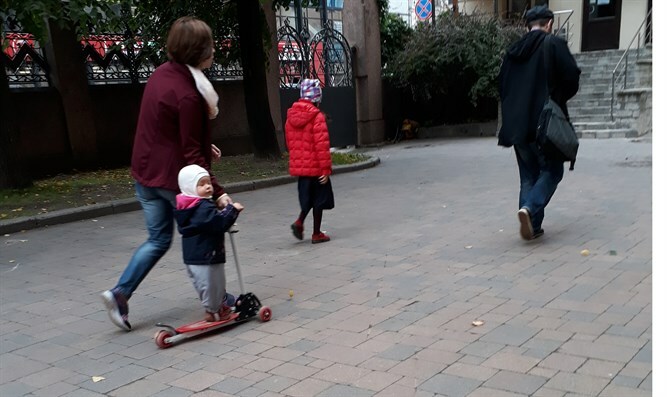 Russian parents (as Israeli educators well know, ed.) expect a very high level of secular studies, and it's hard to do both in the same school, hence the need for both a boy's cheder and the day school." How do you reach young adults? "We are part of the "Stars" (cochavim) program for 18-25 year olds who meet twice weekly and go to on a trip annually, with Israel one of the central trips. 130 young adults came for our recent opening night." "Bar mitzvah groups, the Energy program for 13-17 year olds and a Sunday school attract others. " On what level does the shul function? "There is a minyan 3 times a day and about 150 people come to Shabbat services," he continues. "And this is not the only shul in the city. 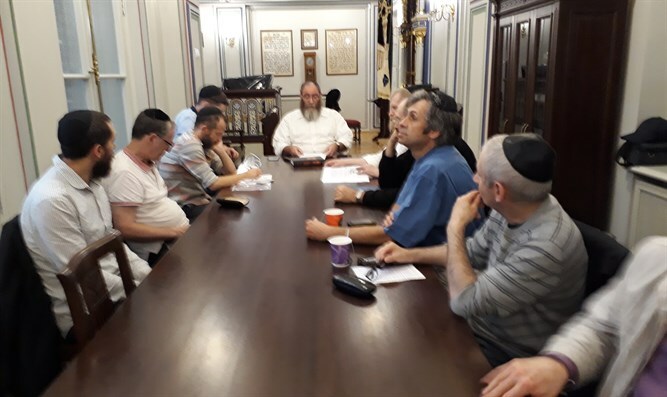 As you know, this past Shabbat our synagogue hosted the Kollel Torah seminar, in honor of people who come to study Torah every night in 100 Russian cities, about 10-20 in each, learning Halakha, Mishna, Hassidus, the weekly Torah reading, in translated books." Visibly moved, he says: "We gave aliyos (blessings for Torah readings) to people who took upon themselves the observance of various mitzvot. Two pledged to have a brit after the seminar." 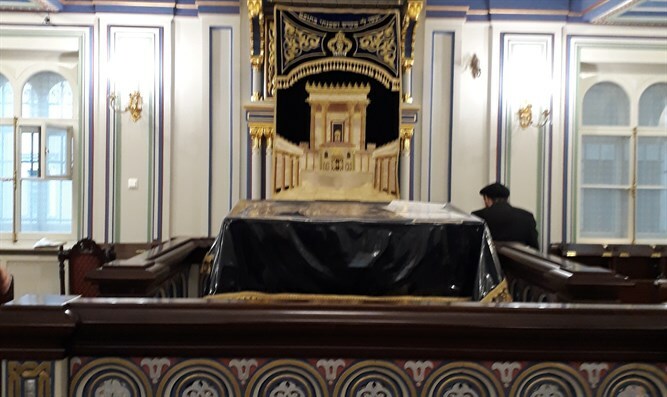 The Rabbi took us into the hassidic shul next to the large one to see the group of adult and elderly men who attend his nightly shiur In Russian. Some of them remember the days when Judaism was taboo and were reluctant to let us photograph them, so we left them out of camera range and blurred the photo a bit. It was so very moving to see them leaning over their texts to learn the weekly portion after evening prayers. "There are a good many rachamim (mercy) programs for humanitarian aid, including medical care and helping patients move up dates for surgery. "We also fill the needs of a Jewish community, with a mikveh, kashrut certification and more." How did you get all this off the ground? "That is a real story. The shul was in terrible shape when we came, but we began our outreach work anyway. And then, one day in 1992, we stopped to buy something and I guess we were noticeable. Someone came over and asked who we were, who turned out to be Edmond Safra. He came to the shul and promised to help. He had received a 'dollar from the Rebbe' and decided to donate to our work. Two years later, he came again with his wife, saw all the work we were doing, but didn't promise anything more. My wife began to cry when he left, but then, we were told that his wife wants to help and she gave us 1 million dollars! Everything is a result of that siyata dishmaya (God's help)." Where is Israel in all this? "I would be happy to see St. Petersburg's Jews move to Israel where I know they will remain Jewish. The Naaleh program was a wonderful thing and did much to bring families to Israel. But aliya is not in the cards for many of the Jews here – so we have to be here for them." 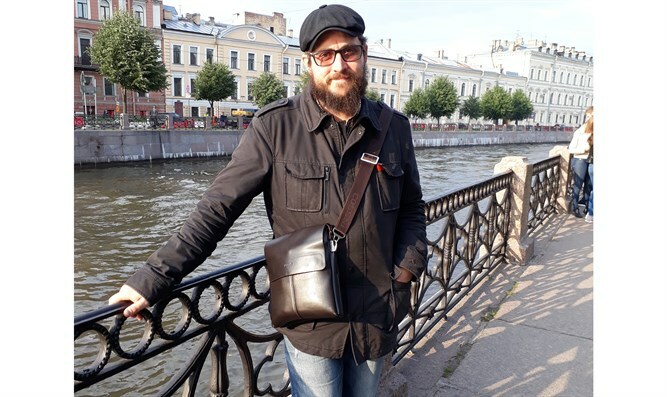 Roman Korovin is a charming Hebrew speaking tour guide, also a Chabadnik, filled with fascinating information about the city and its environs. Naturally, he takes us to Pushkin and Peterhof, regales us with the hidden waterworks in the gardens, evidence of Peter the Great's sense of humor, giving up at some point at our succeeding in mastering the Russian royal family, let alone the Yosipov dynasty. He guides us through the canals, the gorgeous palaces, pointing out the furniture, porcelain and objects d'art, showing us Rasputin's murder scene, losing us for hours in the Hermitage. 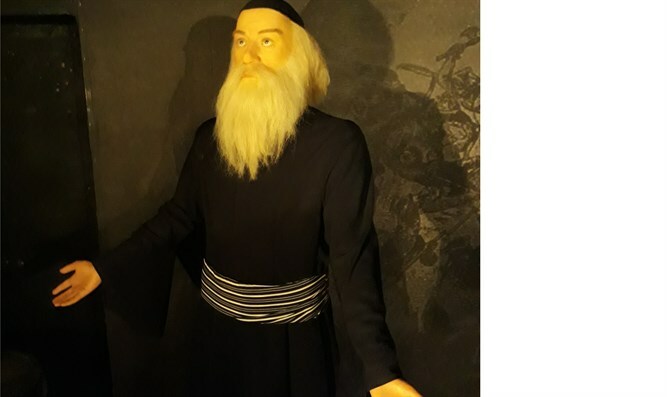 But his forte is satisfying our curiosity about Jewish history interwoven into the city sights, and his Chabad connections come to the fore when he takes us to the Wax Museum on the Peter and Paul fortress grounds and we see the figure of the Alter Rebbe, freed on the 19th of Kislev 5559 (1798). Leon Trotsky, also a Jew, is in wax there as well. Among the many stops, we see the porch where, while the KGB was arresting the sixth Rebbe, his daughter Chaya Mushka came out to the porch and intrepidly shouted down to Rav Menachem Mendel, who was about to enter the house, that there were unexpected guests, thereby preventing the next Rebbe, Rav Schneerson, from being arrested. Later, Roman takes us to off the beaten track to little known Jewish landmarks, such as the diamond merchant Margolin's house, with its imposing crest showing a Jewish and Russian soldier, meant to indicate the brotherhood between the two in WWI. We see the Jewish high school built by Ginzburg, closed in1938 when its principal was arrested, and the first ORT vocational school, built by Polyakov who lived on the premises, and in contrast, a building with anti-Semitic decorations of a Star of David with a horned Jewish face inside it. At the Choral Synagogue, we learn another historical reference from Roman that illustrates the poignancy of Jewish diaspora life through the ages: "Up here are the names of the two wealthy, 19th century Jews, Polyakov and Ginsberg, who did not join the plethora of conversions to Christianity during their times, and are on the plaque decorating the outside of the shul. The Tsarina ordered the shul to be built to bring the Jews in to a smaller area rather than having them spread in outlying villages, but she wouldn't fund it, so a 25 ruble tax was levied on congregants who could afford it – their names are on the heavy solid wood benches carved lovingly by Jewish carpenters - and the two wealthiest and involved Jews added the rest." There is a protective high metal fence and guard at the gate of the synagogue complex, but nowadays that is part of the international security landscape. Only here, as the New Year approaches, we utter a prayer for the religious welfare of the Jews of St. Petersburg, thanking those who labor to keep it intact. And hoping they are granted the fulfillment of "Next year in Jerusalem."